For the county, see Montgomery County, Alabama. "The Gump", "Birthplace of the Civil Rights Movement”, "Cradle of the Confederacy"
Montgomery is the capital city of the U.S. state of Alabama and the county seat of Montgomery County. Named for Richard Montgomery, it stands beside the Alabama River, on the coastal Plain of the Gulf of Mexico. In the 2010 Census, Montgomery's population was 205,764. It is the second most populous city in Alabama, after Birmingham, and is the 118th most populous in the United States. The Montgomery Metropolitan Statistical Area's population in 2010 was estimated at 374,536; it is the fourth largest in the state and 136th among United States metropolitan areas. The city was incorporated in 1819 as a merger of two towns situated along the Alabama River. It became the state capital in 1846, representing the shift of power to the south-central area of Alabama with the growth of cotton as a commodity crop of the Black Belt and the rise of Mobile as a mercantile port on the Gulf Coast. 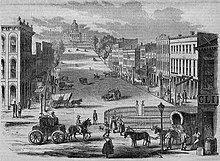 In February 1861, Montgomery was chosen the first capital of the Confederate States of America, which it remained until the Confederate seat of government moved to Richmond, Virginia, in May of that year. In the middle of the 20th century, Montgomery was a major center of events and protests in the Civil Rights Movement, including the Montgomery Bus Boycott and the Selma to Montgomery marches. 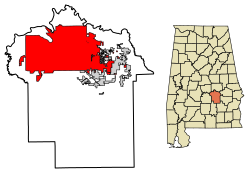 In addition to housing many Alabama government agencies, Montgomery has a large military presence, due to Maxwell Air Force Base; public universities Alabama State University, Troy University (Montgomery campus), and Auburn University at Montgomery; two private post-secondary institutions, Faulkner University and Huntingdon College; high-tech manufacturing, including Hyundai Motor Manufacturing Alabama; and many cultural attractions, such as the Alabama Shakespeare Festival and the Montgomery Museum of Fine Arts. Two ships of the United States Navy have been named after the city, including USS Montgomery. Montgomery has also been recognized nationally for its downtown revitalization and new urbanism projects. It was one of the first cities in the nation to implement Smart Code Zoning. Prior to European colonization, the east bank of the Alabama River was inhabited by the Alibamu tribe of Native Americans. The Alibamu and the Coushatta, who lived on the west side of the river, were descended from the Mississippian culture. 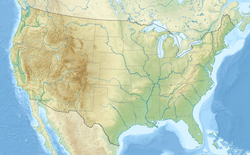 This civilization had numerous chiefdoms throughout the Midwest and South along the Mississippi and its tributaries, and had built massive earthwork mounds as part of their society about 950–1250 AD. Its largest location was at Cahokia, in present-day Illinois east of St. Louis. The historic tribes spoke mutually intelligible Muskogean languages, which were closely related. Present-day Montgomery is built on the site of two Alibamu towns: Ikanatchati (Ekanchattee or Ecunchatty or Econachatee), meaning "red earth;" and Towassa, built on a bluff called Chunnaanaauga Chatty. The first Europeans to travel through central Alabama were Hernando de Soto and his expedition, who in 1540 recorded going through Ikanatchati and camping for one week in Towassa. The next recorded European encounter occurred more than a century later, when an English expedition from Carolina went down the Alabama River in 1697. The first permanent European settler in the Montgomery area was James McQueen, a Scots trader who settled there in 1716. He married a high-status woman in the Coushatta or Alabama tribe. Their mixed-race children were considered Muskogean, as both tribes had a matrilineal system of property and descent. The children were always considered born into their mother's clan, and gained their status from her people. In 1785, Abraham Mordecai, a war veteran from a Sephardic Jewish family of Philadelphia, Pennsylvania, established a trading post. The Coushatta and Alabama had gradually moved south and west in the tidal plain. After the French were defeated by the British in 1763 in the Seven Years' War and ceded control of their lands, these Native American peoples moved to parts of present-day Mississippi, Louisiana, and Texas, then areas of Spanish rule, which they thought more favorable than British-held areas. By the time Mordecai arrived, Creek had migrated into and settled in the area, as they were moving away from Cherokee and Iroquois warfare to the north. Mordecai married a Creek woman. When her people had to cede most of their lands after the 1813-14 Creek War, she joined them in removal to Indian Territory. Mordecai brought the first cotton gin to Alabama. The Upper Creek were able to discourage most European-American immigration until after the conclusion of the Creek War. Following their defeat by General Andrew Jackson in August 1814, the Creek tribes were forced to cede 23 million acres to the United States, including remaining land in today's Georgia and most of today's central and southern Alabama. In 1816, the Mississippi Territory (1798–1817) organized Montgomery County. Its former Creek lands were sold off the next year at the federal land office in Milledgeville, Georgia. The first group of European-American settlers to come to the Montgomery area was headed by General John Scott. This group founded Alabama Town about 2 miles (3 km) downstream on the Alabama River from present-day downtown Montgomery. In June 1818, county courts were moved from Fort Jackson to Alabama Town. 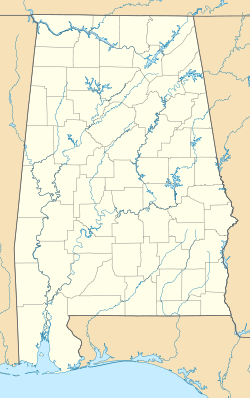 Alabama was admitted to the Union in December 1819. Soon after, Andrew Dexter Jr. founded New Philadelphia, the present-day eastern part of downtown. He envisioned a prominent future for his town; he set aside a hilltop known as "Goat Hill" as the future site of the state capitol building. New Philadelphia soon prospered, and Scott and his associates built a new town adjacent, calling it East Alabama Town. Originally rivals, the towns merged on December 3, 1819, and were incorporated as the town of Montgomery. The name Montgomery came from Richard Montgomery, a Revolutionary War general. Slave traders used the Alabama River to deliver slaves to planters as laborers to work the cotton. Buoyed by the revenues of the cotton trade at a time of high market demand, the newly united Montgomery grew quickly. In 1822, the city was designated as the county seat. A new courthouse was built at the present location of Court Square, at the foot of Market Street (now Dexter Avenue). 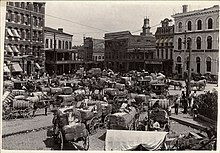 Court Square had one of the largest slave markets in the South. The state capital was moved from Tuscaloosa to Montgomery, on January 28, 1846. On April 12, 1865, following the Battle of Selma, Major General James H. Wilson captured Montgomery for the Union. In 1886 Montgomery became the first city in the United States to install citywide electric street cars along a system that was nicknamed the Lightning Route. Residents followed the street car lines to settle in new housing in what were then "suburban" locations. In the post-World War II era, returning African-American veterans were among those who became active in pushing to regain their civil rights in the South: to be allowed to vote and participate in politics, to freely use public places, to end segregation. According to the historian David Beito of the University of Alabama, African Americans in Montgomery "nurtured the modern civil rights movement." African Americans comprised most of the customers on the city buses, but were forced to give up seats and even stand in order to make room for whites. On December 1, 1955, Rosa Parks was arrested for refusing to give up her bus seat to a white man, sparking the Montgomery Bus Boycott. Martin Luther King Jr., then the pastor of Dexter Avenue Baptist Church, and E.D. Nixon, a local civil rights advocate, founded the Montgomery Improvement Association to organize the boycott. In June 1956, the US District Court Judge Frank M. Johnson ruled that Montgomery's bus racial segregation was unconstitutional. After the US Supreme Court upheld the ruling in November, the city desegregated the bus system, and the boycott was ended. In separate action, integrated teams of Freedom Riders rode South on interstate buses. In violation of federal law and the constitution, bus companies had for decades acceded to state laws and required passengers to occupy segregated seating in Southern states. Opponents of the push for integration organized mob violence at stops along the Freedom Ride. In Montgomery, there was police collaboration when a white mob attacked Freedom Riders at the Greyhound Bus Station in May 1961. Outraged national reaction resulted in the enforcement of desegregation of interstate public transportation. Martin Luther King Jr. returned to Montgomery in 1965. Local civil rights leaders in Selma had been protesting Jim Crow laws and practices that raised barriers to blacks registering to vote. Following the shooting of a man after a civil rights rally, the leaders decided to march to Montgomery to petition Governor George Wallace to allow free voter registration. The violence they encountered from county and state highway police outraged the country. The federal government ordered National Guard and troops to protect the marchers. Thousands more joined the marchers on the way to Montgomery, and an estimated 25,000 marchers entered the capital to press for voting rights. These actions contributed to Congressional passage of the Voting Rights Act of 1965, to authorize federal supervision and enforcement of the rights of African Americans and other minorities to vote. On February 7, 1967, a devastating fire broke out at Dale's Penthouse, a restaurant and lounge on the top floor of the Walter Bragg Smith apartment building (now called Capital Towers) at 7 Clayton Street downtown. Twenty-six people died. In recent years, Montgomery has grown and diversified its economy. Active in downtown revitalization, the city adopted a master plan in 2007; it includes the revitalization of Court Square and the riverfront, renewing the city's connection to the river. Many other projects under construction include the revitalization of Historic Dexter Avenue, pedestrian and infrastructure improvements along the Selma to Montgomery National Historic Trail, and the construction of a new environmental park on West Fairview Aven. Montgomery is located at 32°21′42″N 86°16′45″W﻿ / ﻿32.36167°N 86.27917°W﻿ / 32.36167; -86.27917. According to the U.S. Census Bureau, the city has a total area of 156.2 square miles (405 km2), of which 155.4 square miles (402 km2) is land and 0.8 square miles (2.1 km2) (0.52%) is water. The city is built over rolling terrain at an elevation of about 220 feet (67 m) above sea level. 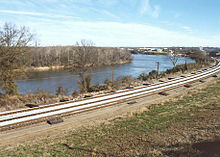 Downtown Montgomery lies along the southern bank of the Alabama River, about 6 miles (9.7 km) downstream from the confluence of the Coosa and Tallapoosa rivers. The most prominent feature of Montgomery's skyline is the 375 ft (114 m), RSA Tower, built in 1996 by the Retirement Systems of Alabama. Other prominent buildings include 60 Commerce Street, 8 Commerce Street, and the RSA Dexter Avenue Building. (See Tallest Buildings in Montgomery, Alabama). Downtown also contains many state and local government buildings, including the Alabama State Capitol. The Capitol is located atop a hill at one end of Dexter Avenue, along which also lies the Dexter Avenue Baptist Church, where Martin Luther King Jr. was pastor. Both the Capitol and Dexter Baptist Church are recognized as National Historic Landmarks by the U.S. Department of the Interior. Other notable buildings include RSA Dexter Avenue, RSA Headquarters, Alabama Center for Commerce, RSA Union, and the Renaissance Hotel and Spa. One block south of the Capitol is the First White House of the Confederacy, the 1835 Italianate-style house in which President Jefferson Davis and family lived while the Confederate capital was in Montgomery. Montgomery's third National Historic Landmark is Union Station. Passenger train service to Montgomery ceased in 1989. Today Union Station is part of the Riverfront Park development, which includes an amphitheater, a riverboat dock, a river walk, and Riverwalk Stadium. Three blocks east of the Convention Center, Old Alabama Town showcases more than 50 restored buildings from the 19th century. The Riverwalk is part of a larger plan to revitalize the downtown area and connect it to the waterfront. The plan includes urban forestry, infill development, and façade renovation to encourage business and residential growth. A 112,000-square-foot (10,400 m2) The Convention Center, completed in 2007, has encouraged growth and activity in the downtown area, and attracted more high-end retail and restaurants. Other downtown developments includes historic Dexter Avenue, which will be the center of a Market District. A $6 million streetscape project is improving its design. Maxwell Boulevard is home to the newly built Wright Brothers Park. High-end apartments are planned for this area. The Bell Building, located across from the Rosa Parks Library and Museum, is being redeveloped for mixed-use retail and residential space. The National Memorial for Peace and Justice opened in downtown Montgomery on April 26, 2018. Founded by the Equal Justice Initiative, it acknowledges the historic past of racial terrorism and lynching in America. South of downtown, across Interstate 85, lies Alabama State University. ASU's campus was built in Colonial Revival architectural style from 1906 until the beginning of World War II. Surrounding ASU are the Garden District and Cloverdale Historic District. Houses in these areas date from around 1875 until 1949, and are in Late Victorian and Gothic Revival styles. Huntingdon College is on the southwestern edge of Cloverdale. The campus was built in the 1900s in Tudor Revival and Gothic Revival styles. ASU, the Garden District, Cloverdale, and Huntingdon are all listed on the National Register of Historic Places as historic districts. Montgomery's east side is the fastest-growing part of the city. Development of the Dalraida neighborhood, along Atlanta Highway, began in 1909, when developers Cook and Laurie bought land from the Ware plantation. A Scotsman, Georgie Laurie named the area for Dál Riata, a 6th-7th century Gaelic overkingdom; a subsequent misspelling in an advertisement led to the current spelling. The first lots were sold in 1914. The city's two largest shopping malls (Eastdale Mall and The Shoppes at Eastchase), as well as many big-box stores and residential developments, are on the east side. The area is also home of the Wynton M. Blount Cultural Park. This 240-acre (1.0 km2) park contains the Alabama Shakespeare Festival and Montgomery Museum of Fine Arts. Montgomery has been recognized nationally for its continuing downtown revitalization. 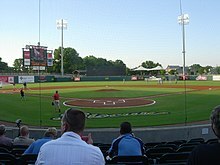 In the early 2000s, the city constructed the Montgomery Biscuits minor league baseball stadium and Riverfront Park. Following those developments, hundreds of millions of dollars have been invested by private companies that have adapted old warehouses and office buildings into loft apartments, restaurants, retail, hotels, and businesses. The demand for downtown living space has risen, as people want to have walkable, lively neighborhoods. More than 500 apartment units are under construction, including The Heights on Maxwell Boulevard, The Market District on Dexter Avenue, the Kress Building on Dexter Avenue, The Bell Building on Montgomery Street, and a new complex by the convention center. Montgomery has a humid subtropical climate (Köppen Cfa), with short, mild winters, warm springs and autumns, and long, hot, humid summers. The daily average temperature in January is 46.6 °F (8.1 °C), and there are 3.4 days of sub-20 °F (−7 °C) lows; 10 °F (−12 °C) and below is extremely rare. The daily average in July is 81.8 °F (27.7 °C), with highs exceeding 90 °F (32.2 °C) on 86 days per year and 100 °F (37.8 °C) on 3.9. Summer afternoon heat indices, much more often than the actual air temperature, are frequently at or above 100 °F. The diurnal temperature variation tends to be large in spring and autumn. Rainfall is well-distributed throughout the year, though February, March and July are the wettest months, while October is significantly the driest month. Snowfall occurs only during some winters, and even then is usually light. Substantial snowstorms are rare, but do occur approximately once every 10 years. Extremes range from −5 °F (−21 °C) on February 13, 1899 to 107 °F (42 °C) on July 7, 1881. Thunderstorms bring much of Montgomery's rainfall. These are common during the summer months but occur throughout the year. Severe thunderstorms – producing large hail and damaging winds in addition to the usual hazards of lightning and heavy rain – can occasionally occur, particularly during the spring. Severe storms also bring a risk of tornadoes. Sometimes, tropical disturbances – some of which strike the Gulf Coast as hurricanes before losing intensity as they move inland – can bring very heavy rains. As of the 2010 census, the population of the city was 205,764. There were 81,486 households, out of which 29% had children under the age of 18 living with them. The racial makeup of the city was 56.6% Black, 37.3% White, 2.2% Asian, 0.2% Native American, 0.1% Pacific Islander, 2.2% from other races, and 1.3% from two or more races. 3.9% of the population were Hispanic or Latino of any race. Non-Hispanic Whites were 36.1% of the population in 2010, down from 66% in 1970. The population density varies in different parts of the city; East Montgomery (Taylor Rd and East), the non-Hispanic White population is 74.5%, 8.3% African American, Latino 3.2%, other non-white races carry 2.7% of the population. The city population was spread out with 24.9% under the age of 18, 11.7% from 18 to 24, 27.3% from 25 to 44, 24.2% from 45 to 64, and 11.8% who were 65 years of age or older. The median age was 34 years. For every 100 females, there were 88.6 males. For every 100 females age 18 and over, there were 84.5 males. The median income for a household in the city was $41,380, and the median income for a family was $53,125. Males had a median income of $40,255 versus $33,552 for females. The per capita income for the city was $23,139. About 18.2% of families and 21.6% of the population were below the poverty line, including 34.8% of those under age 18 and 8.4% of those age 65 or over. Montgomery's central location in Alabama's Black Belt has long made it a processing hub for commodity crops such as cotton, peanuts, and soybeans. In 1840 Montgomery County led the state in cotton production, and by 1911, the city processed 160,000–200,000 bales of cotton annually. Montgomery has also had large metal fabrication and lumber production sectors. Due to its location along the Alabama River and extensive rail connections, Montgomery has been and continues to be a regional distribution hub for a wide range of industries. Since the late 20th century, it has diversified its economy, achieving increased employment in sectors such as healthcare, business, government, and manufacturing. Today, the city's Gross Metropolitan Product is $12.15 billion, representing 8.7% of the gross state product of Alabama. As of January 2011, Montgomery's largest employers were Maxwell-Gunter Air Force Base (12,280 employees), the state of Alabama (9,500), Montgomery Public Schools (4,524), Baptist Health (4,300), Hyundai Motor Manufacturing Alabama (3,000), Alfa Insurance (2,568), the City of Montgomery (2,500), Jackson Hospital & Clinic (1,300), Rheem Water Heaters (1,147), and Regions (977). According to Pennsylvania State University's Living Wage Calculator, the living wage for the city is US$8.02 per hour (or $16,691 per year) for an individual and $25.80 per hour ($53,662 per year) for a family of four. These are slightly higher than the state averages of $7.45 per hour for an individual and $25.36 for a family of four. Montgomery serves as a hub for healthcare in the central Alabama and Black Belt region. Hospitals located in the city include Baptist Medical Center South on South East Boulevard, Baptist Medical Center East next to the campus of Auburn University Montgomery on Taylor Road, and Jackson Hospital, which is located next to Oak Park off interstate 85. Montgomery is also home to two medical school campuses: Baptist Medical Center South (run by University of Alabama at Birmingham) and Jackson Hospital (run by Alabama Medical Education Consortium). Montgomery operates under a Mayor–council government system. The mayor and council members are elected to four-year terms. The current mayor is Todd Strange, who was elected mayor in a special election, held March 10, 2009, after mayor Bobby Bright was elected to U.S. Congress for the 2nd district. The city is served by a nine-member city council, elected from nine single-member districts of equal size population. As the seat of Montgomery County, the city is the location of county courts and the county commission, elected separately. 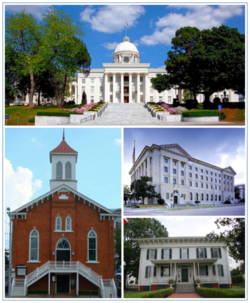 Montgomery is the capital of Alabama, and hosts numerous state government offices, including the office of the Governor, the Alabama Legislature, and the Alabama Supreme Court. At the federal level, Montgomery is part of Alabama's 2nd, 7th, and 3rd Congressional district, currently represented by Martha Roby, Terri Sewell, and Mike Rogers, respectively. Montgomery's crime rates compare favorably to other large cities in the state. In 2009 Montgomery's violent crime rate was 429.4 per 100,000, well below that of Birmingham, Huntsville, and Mobile, below the state average, and similar to the national average. For property crimes, Montgomery's average is similar to Alabama's other large cities, but higher than the overall state and national averages. Montgomery has more than 1600 acres of parkland, which are maintained and operated by the City of Montgomery Parks and Recreation Department. The department also operates 24 community centers, a skate park, two golf courses (Lagoon Park and Gateway Park), Cramton Bowl Stadium and Multiplex, two tennis centers (Lagoon Park and O'Conner), 65 playgrounds, 90 baseball/softball fields, 24 soccer fields including the Emory Folmar Soccer Facility, and one riverboat. Currently a new environmental park is under construction along West Fairview Avenue close to Interstate 65. Montgomery has one of the biggest arts scenes of any mid-sized city in America. The Wynton M. Blount Cultural Park in east Montgomery is home to the Montgomery Museum of Fine Arts. The museum's permanent collections include American art and sculpture, Southern art, master prints from European masters, and collections of porcelain and glass works. The Society of Arts and Crafts operates a co-op gallery for local artists. Montgomery Zoo holds more than 500 animals, from five continents, in 40 acres (0.16 km2) of barrier-free habitats. The Hank Williams Museum contains one of the largest collections of Williams memorabilia in the world. The Museum of Alabama serves as the official state history museum and is located in the Alabama Department of Archives and History building downtown. This museum was renovated and expanded in 2013 in a $10 million project that includes technological upgrades and many new exhibits and displays. The W. A. Gayle Planetarium, operated by Troy University, is one of the largest in the southeast United States and offers tours of the night sky and shows about current topics in astronomy. The planetarium was upgraded to a full-dome digital projector in 2014. Blount Park also contains the Alabama Shakespeare Festival's Carolyn Blount Theatre. The Shakespeare Festival presents year-round performances of both classic plays and performances of local interest, in addition to works of William Shakespeare. The 1200-seat Davis Theatre for the Performing Arts, on the Troy University at Montgomery campus, opened in 1930 and was renovated in 1983. It houses the Montgomery Symphony Orchestra, Alabama Dance Theatre and Montgomery Ballet, as well as other theatrical productions. The Symphony has been performing in Montgomery since 1979. The Capri Theatre in Cloverdale was built in 1941, and today shows independent films. The 1800-seat state-of-the-art Montgomery Performing Arts Center opened inside the newly renovated convention center downtown in 2007. It hosts a range of performances, from Broadway plays to concerts, and performers such as BB King, Gregg Allman, and Merle Haggard. Numerous musical performers have roots in Montgomery: Toni Tennille of the duo The Captain and Tennille, jazz singer and pianist Nat King Cole, country singer Hank Williams, blues singer Big Mama Thornton, Melvin Franklin of The Temptations, and guitarist Tommy Shaw of Styx. Author and artist Zelda Sayre was born in Montgomery. In 1918, she met F. Scott Fitzgerald, then a young soldier stationed at an Army post nearby. The house where they lived when first married is today operated as the F. Scott and Zelda Fitzgerald Museum. Poet Sidney Lanier lived in Montgomery and Prattville immediately after the Civil War, while writing his novel Tiger Lilies. In addition to those notable earlier musicians, some of the rock bands from Montgomery have achieved national success since the late 20th century. Locals artists Trust Company were signed to Geffen Records in 2002. Hot Rod Circuit formed in Montgomery in 1997 under the name Antidote, but achieved success with Vagrant Records after moving to Connecticut. The Ed Kemper Trio became well known in Montgomery's local rock music scene from 1997 to 2004. They were the subject of People Will Eat Anything, a music documentary directed by Shane Gillis. It premiered at the Capri Theatre in 2004. The musicians have established independent careers since then. Montgomery is home of the Montgomery Biscuits baseball team. The Biscuits play in the Class AA Southern League. They are affiliated with the Tampa Bay Rays, and play at Montgomery Riverwalk Stadium. Riverwalk Stadium hosted the NCAA Division II National Baseball Championship from 2004 until 2007. The championship had previously been played at Paterson Field in Montgomery from 1985 until 2003. Riverwalk Stadium has also been host to two Southern League All-Star games in 2006 and 2015. The Yokohama Tire LPGA Classic women's golf event is held at the Robert Trent Jones Golf Trail at Capitol Hill in nearby Prattville. Garrett Coliseum was the home of the now-defunct Montgomery Bears indoor football team. Montgomery is also the site of sporting events hosted by the area's colleges and universities. The Alabama State University Hornets play in NCAA Division I competition in the Southwestern Athletic Conference (SWAC). The football team plays at Hornet Stadium, the basketball teams play at the Dunn-Oliver Acadome, and the baseball team plays at the ASU Baseball Complex, which recently opened on March 26, 2010. Auburn University at Montgomery also fields teams in NAIA competition. Huntingdon College participates at the NCAA Division III level and Faulkner University is a member of the NAIA and is a nearby rival of Auburn University at Montgomery. The Blue–Gray Football Classic was an annual college football all-star game held from 1938 until 2001. In 2009, the city played host to the first annual Historical Black College and University (HBCU) All-Star Football Bowl played at Cramton Bowl. Beginning in 2014 Montgomery will be host to the Southern Intercollegiate Athletic Conference football championship, this will take place in Cramton Bowl. Starting in December 2014, Montgomery will host the Camellia Bowl at the Cramton Bowl as part of the annual college football bowl game schedule. Montgomery annually hosts the Max Capital City Classic inside Riverwalk Stadium which is a baseball game between big rivals Auburn University and The University of Alabama. The city was host to the 2015 World Firefighter Combat Challenge. It aired on ESPN in October of that year. In 2016 Montgomery was also the host city to the National Horseshoe Pitchers Association World Horseshoe Tournament. Montgomery has many active governmental and nonprofit civic organizations. City funded organizations include the Montgomery Clean City Commission (a Keep America Beautiful Affiliate) which works to promote cleanliness and environmental awareness. BONDS (Building Our Neighborhoods for Development and Success) which works to engage citizens about city/nonprofit programs, coordinates/assists neighborhood associations, and works promote neighborhood and civic pride amongst Montgomery residents. A number of organizations are focused on diversity relations and the city's rich civil rights history. Leadership Montgomery provides citizenship training. Bridge Builders Alabama works with high school youth to promote diversity and civic engagement. The group One Montgomery was founded in 1983 and is a forum for networking of a diverse group of citizens active in civic affairs. Montgomery is also home to the The Legacy Museum, Civil Rights Memorial, Freedom Rides Museum, and the Rosa Parks Library and Museum. The city of Montgomery and Montgomery County are served by the Montgomery Public Schools system. As of 2007, there were 32,520 students enrolled in the system, and 2,382 teachers employed. The system manages 32 elementary schools, 10 middle schools, and 5 high schools as well as 9 magnet schools, 1 alternative school, and 2 special education centers. Montgomery is one of the only cities in the southeast to host three public schools with International Baccalaureate programs. In 2007, Forest Avenue Academic Magnet Elementary School was named a National Blue Ribbon School. In 2018, LAMP High School was named the No. 13 magnet school in the United States and No. 1 public high school in the state of Alabama on U.S. News & World Report's list. Three other Montgomery Public Schools high schools were also on the list, the most of any public school system in the state (BTW Magnet, Brewbaker Technology Magnet, and Carver High School). Montgomery is also home to 28 private schools. The Montgomery City-County Public Library operates eleven public libraries in locations throughout the city and county. The city is home to Alabama's oldest law library, the Supreme Court and State Law Library, founded in 1828. Located in the Heflin-Torbert Judicial Building, the Law Library owns a rare book collection containing works printed as early as 1605. 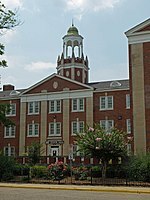 Montgomery has been the home of Alabama State University, a historically black university, since the Lincoln Normal University for Teachers relocated from Marion in 1887. Today, ASU is the largest HBCU in Alabama enrolling nearly 6,000 students from 42 U.S. states and 7 countries. The public Troy University maintains a 3,000 student population campus in downtown Montgomery that houses the Rosa Parks Library and Museum. Another public institution, Auburn University at Montgomery, with an enrollment of nearly 5,000 overwhelmingly from the Montgomery area, is in the eastern part of the city. Montgomery's Baptist Medical Center South also hosts a branch of the University of Alabama Birmingham medical school on its campus on the Eastern Boulevard. Montgomery also is home to several private colleges: Faulkner University, which has an enrollment of 3,500, is a Church of Christ-affiliated school which is home to the Thomas Goode Jones School of Law. Huntingdon College, which has a current student population of 1,000 and is affiliated with the United Methodist Church; Virginia College and Amridge University. Montgomery is served by seven local television stations: WNCF 32 (ABC), WSFA 12 (NBC), WCOV 20 (Fox), WBMM 22 (CW), WAIQ 26 (PBS), WMCF 45 (TBN), WFRZ-LD 34 (Religious and Educational). In addition, WAKA 8 (CBS), licensed to Selma but operating out of Montgomery, and WBIH 29 (independent) located in Selma, and WIYC 67 (AMV) is licensed to Troy. Montgomery is part of the Montgomery-Selma Designated Market Area (DMA), which is ranked 118th nationally by Nielsen Media Research. Charter Communications and Knology provide cable television service. DirecTV and Dish Network provide direct broadcast satellite television including both local and national channels to area residents. The Montgomery area is served by eight AM radio stations: WMSP, WMGY, WZKD, WTBF, WGMP, WAPZ, WLWI, and WXVI; and nineteen FM stations: WJSP, WAPR, WELL, WLBF, WTSU, WVAS, WLWI, WXFX, WQKS, WWMG, WVRV, WJWZ, WBAM, WALX, WHHY, WMXS, WHLW, WZHT, and WMRK. Montgomery is ranked 150th largest by Arbitron. NOAA Weather Radio station KIH55 broadcasts weather and hazard information for Montgomery and vicinity. Two interstate highways run through Montgomery. Interstate 65 is the primary north–south freeway through the city leading between Birmingham and Huntsville to the north and Mobile to the south. Montgomery is the southern terminus of Interstate 85, another north–south freeway (though running east–west in the city), which leads northeast to Atlanta. The major surface street thoroughfare is a loop consisting of State Route 152 in the north, U.S. Highway 231 and U.S. Highway 80 in the east, U.S. Highway 82 in the south, and U.S. Highway 31 along the west of the city. The Alabama Department of Transportation is planning the Outer Montgomery Loop to ease traffic congestion in the city. It is planned to connect Interstate 85 near Mt. Meigs to U.S. Highway 80 southwest of the city. Upon completion of the loop, it will carry the I-85 designation while the original I-85 into the city center will be redesignated I-685. Montgomery Area Transit System (The M) provides public transportation with buses serving the city. The system has 32 buses providing an average of 4500 passenger trips daily. The M's ridership has shown steady growth since the system was revamped in 2000; the system served over 1 million passenger trips in 2007. Greyhound Lines operates a terminal in Montgomery for intercity bus travel; Megabus (North America) also operates in the city out of the downtown Intermodel Transit Facility. Montgomery Regional Airport, also known as Dannelly Field, is the major airport serving Montgomery. It serves primarily as an Air National Guard base and for general aviation, but commercial airlines fly to regional connections to Atlanta, Dallas-Fort Worth and Charlotte. According to the 2016 American Community Survey, 84.3% of working city of Montgomery residents commuted by driving alone, 8.8% carpooled, 0.4% used public transportation, and 0.6% walked. About 3.5% used all other forms of transportation, including taxicab, motorcycle, and bicycle. About 5.9% of working city of Montgomery residents worked at home. Despite the high level of commuting by automobile, 8.5% of city of Montgomery households were without a car in 2015, which increased to 11% in 2016. The national average was 8.7 percent in 2016. Montgomery averaged 1.62 cars per household in 2016, compared to a national average of 1.8 per household. ^ "City of Montgomery : Capital of Dreams Video". Montgomeryal.gov. Archived from the original on June 25, 2014. Retrieved August 11, 2014. ^ a b An act to incorporate the town of Montgomery in the county of Montgomery. Archived November 29, 2002, at the Wayback Machine Approved December 3, 1819. Alabama Legislative Acts. Annual Session, Oct – Dec 1819. Pages 110-112. Access Date: January 5, 2014. ^ Spencer, Thomas (February 25, 2011). "2010 Census: Rural to urban shift for Alabama population". al.com. Archived from the original on June 24, 2011. Retrieved June 24, 2011. ^ "SmartCode Manual (revised)". City of Montgomery. Planning. Retrieved May 23, 2018. ^ Brown, Russel K. (1994). To The Manner Born: The Life Of General William H. T. Walker. Athens, Georgia: University of Georgia Press. ISBN 9780865549449. Retrieved July 22, 2013. ^ "Charles J. Van Depoele". Retrieved December 14, 2008. ^ "AirNav: KMGM – Montgomery Regional Airport (Dannelly Field)". Retrieved August 17, 2008. ^ "RSA | Dexter Avenue Building". Rsarealestate.com. Retrieved November 18, 2012. ^ "Montgomery Market District". Montgomery Market District. Retrieved August 11, 2014. ^ Davis, Bethany (January 8, 2014). "New luxury apartments coming to Montgomery's Maxwell Blvd". Apmobile.worldnow.com. Retrieved August 11, 2014. ^ Campbell Robertson (April 25, 2018). "A Lynching Memorial Is Opening. The Country Has Never Seen Anything Like It". New York Times. ^ "History". Alabama State University. Archived from the original on May 4, 2008. Retrieved August 23, 2008. ^ Wright, Carolyn (July 13, 2014). "Early ads boast of fine living in 'Dalriata' neighborhood". Montgomery Advertiser. p. 4D. ^ "Climatography of the United States No. 20 (1971–2000)" (PDF). National Oceanic and Atmospheric Administration. 2004. Archived from the original (PDF) on July 6, 2011. Retrieved June 25, 2010. ^ "Montgomery Alabama Cold Weather Facts". The National Weather Service. Retrieved August 4, 2012. ^ "Daily Averages for Montgomery, AL (36104)". The Weather Channel Interactive, Inc. Archived from the original on February 7, 2009. Retrieved August 17, 2008. ^ "NowData – NOAA Online Weather Data". National Oceanic and Atmospheric Administration. Retrieved October 16, 2018. ^ "AL Montgomery AP". National Oceanic and Atmospheric Administration. Retrieved March 17, 2016. ^ "WMO Climate Normals for Montgomery, AL 1961–1990". National Oceanic and Atmospheric Administration. Retrieved March 17, 2016. ^ "Population Estimates". United States Census Bureau. Retrieved October 3, 2018. ^ a b "Montgomery (city), Alabama". State & County QuickFacts. U.S. Census Bureau. Archived from the original on June 9, 2012. ^ "Alabama - Race and Hispanic Origin for Selected Cities and Other Places: Earliest Census to 1990". U.S. Census Bureau. Archived from the original on August 6, 2012. Retrieved December 24, 2011. ^ a b "Table 4 – Crime in the United States". Federal Bureau of Investigation. September 2010. Archived from the original on July 17, 2011. ^ a b "Table 8 (Alabama) – Crime in the United States 2009". Federal Bureau of Investigation. September 2010. Archived from the original on July 17, 2011. ^ "Recreation, Sports, Culture". Funinmontgomery.com. March 1, 1948. Retrieved August 11, 2014. ^ "Museum of Alabama". Museum.alabama.gov. Retrieved August 11, 2014. ^ "Troy: W. A. Gayle Planetarium". ^ McMurphy, Brett (August 19, 2013). "Bowl created for MAC, Sun Belt". ESPN.com. Retrieved August 20, 2013. ^ "Montgomery Public Schools". Archived from the original on April 28, 2008. Retrieved May 18, 2008. ^ "2007 No Child Left Behind – Blue Ribbon Schools: All Public Elementary Schools" (PDF). US Department of Education. p. 9. Retrieved March 1, 2011. ^ "America's Best High Schools: Magnet Schools List". US News and World Report website. 2018. Retrieved March 15, 2019. ^ "Schools K-12 – Montgomery, AL Private Schools". Retrieved June 21, 2008. ^ "About ASU". Archived from the original on May 22, 2008. Retrieved June 21, 2008. ^ "About Auburn University at Montgomery". Retrieved December 13, 2015. ^ "Faulkner University – Discover Faulnker". Archived from the original on June 4, 2008. Retrieved June 21, 2008. ^ "About HC". Archived from the original on June 12, 2008. Retrieved June 21, 2008. ^ "About Trenholm State: History". Retrieved December 13, 2015. ^ "USAF Air University". Archived from the original on August 21, 2007. Retrieved June 21, 2008. ^ "Local Television Market Universe Estimates". "www.nielsenmedia.com". Retrieved November 17, 2007. ^ "Arbitron Radio Market Rankings: Spring 2011" (PDF). "www.arbitron.com". ^ "Senator Richard C. Shelby". Archived from the original on May 30, 2008. Retrieved June 28, 2008. ^ "Montgomery Area Transit System". Retrieved June 28, 2008. ^ "Chart FY 08.pdf" (PDF). Archived from the original (PDF) on September 10, 2008. Retrieved June 28, 2008. ^ "Greyhound.com : Locations: Montgomery, Alabama". Retrieved June 28, 2008. ^ "Canceled flights: Continental drops Montgomery routes". Archived from the original on June 27, 2014. Retrieved June 28, 2008. ^ "Floridian". Retrieved June 28, 2008. ^ "Gulf Breeze". Retrieved June 28, 2008. Burton, Gary P., "The Founding Four Churches: An Overview of Baptist Beginnings in Montgomery County, Alabama", Baptist History and Heritage (Spring 2012), 47#1 pp 39–51. Wikimedia Commons has media related to Montgomery, Alabama. Wikivoyage has a travel guide for Montgomery. "Montgomery" . New International Encyclopedia. 1905. This page was last edited on 28 March 2019, at 17:25 (UTC).